Will The Tesla Model 3 Lead 2018 Global EV Sales? Does the Tesla Model 3 have what it takes to be a worldwide, best-selling EV? Can Tesla manufacture enough in 2018 to make it a reality? Tesla has finally revealed production numbers for Q1 2018 on its website (they can be found here). The much-awaited news got analysts and media crunching numbers to obtain guidance on the company’s near-term progress and longer-term expectations. Among the most important news is the confirmation that – despite difficulties – Model 3 production is finally ramping up quickly. The big news here is double. First, it is confirmed that a substantial number of Model 3s have been produced, finally becoming a major contribution to Tesla’s numbers. With over 34,000 cars built in total, last quarter represents the company’s most productive ever and a 40% increase over Q4 2017. Second, the weekly pace of Model 3 production is increasing almost exponentially, as early bottlenecks are resolved and production is streamlined. 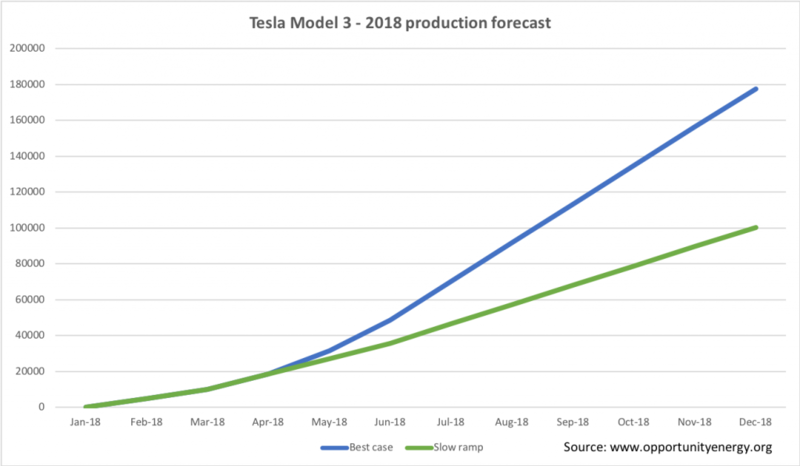 While Model S and X show lower numbers than last quarter and the Model 3 ramp-up is itself short of early predictions, this start of the year still represents a striking result and allows us to speculate on what 2018 final production numbers may be for Tesla and Model 3 in particular. Elon Musk’s company remains bullish on Model 3, with an unchanged target of 5,000 units per week by mid-year. As the pace of 3,000 weekly units is still unproven as a sustainable production rate, we have a long way to go before confirming this is at all possible. We can, however, use these figures to attempt a forecast of worst and best case scenarios for Model 3 by year-end. A range of 100-180,000 units would place the Model 3 as a very strong candidate for world’s best selling electric car this year, but the top rank is not a given. Main contenders? While GM shows no signs of increasing its Bolt offering worldwide, the 2018 Nissan Leaf is sure to be one. The Leaf 2.0 may reach anywhere between 80 and 150,000 units as – despite the underwhelming specs of the new model – Nissan factories are now in full swing with worldwide availability. But let’s not forget that China, with its own burgeoning EV market, already claimed last year’s crown with the little known BAIC EC-Series, at over 78,000 sales (limited to the Chinese market). Will Model 3 come out on top against 2018 Leaf and little-known Chinese models? 24 Comments on "Will The Tesla Model 3 Lead 2018 Global EV Sales?" It’s worth noting that I first published this on my blog on 5th April, hence references to 2000 units per week. Things seem now improved as anticipated, according to trackers including Bloomberg. Thanks, Carlo! I updated the post to account for this now. These analysis also doesn’t take into account any planned down time for maintenance. A factory cannot run 52 weeks of the year. A more mature company like GM plans factories to be offline for many weeks at a time each year to perform maintenance. If indeed there is no planned downtime, expect “unplanned” maintenance downtime instead, which tends to be more disruptive. Thanks for feedback. Downtime is implied in the round numbers I gave to come up with low and high forecast. As you rightly point out, offline periods will disrupt the smooth lines, so while trend will be clear, the actual line of production over time will be more segmented. No. It won’t beat the “underwhelming” Nissan Leaf. Hopefully your correct… that would mean Nissan significantly improves Leaf global sales. The Leaf and Bolt still hold an edge as price-competitive until the cheapest version of the Model III becomes available. I would love to see 100% YoY growth for sales of both vehicles. The shocking reality is, at least in the US, that most people are buying SUVs and their dinky cousins, because the manufacturers make more money off them, and marketing drives those decisions. The main argument is that they are safer in accident (bigger is better). Tell that to the Tesla Model S driver who rear-ended a fire truck going 60mph and limped away with a broken ankle. American car-buying is diseased. It has been fundamentally messed up since the Ford Explorer was tied to the original Jurassic Park movie. Transformers movies from Michael “boom boom” Bay are all about GM cars. Media is establishing what buyers think they want. Well, except Tesla. They don’t advertise. At the moment more Leafs are being sold. Tesla has to ramp up if they want to overtake them. Nissan has a big lead with both LHD and RHD variants of the LEAF available. That means that it can realistically be available worldwide. That response was underwhelming, though accurate concerning throwing shade on the Leaf, which contains a vein of truth. If excluding the Chinese market, yes. If including the Chinese market, greatly depends of China’s policies towards local manufacturing by non-Chinese owned plants, import tariffs, and Chinese government backed underwriting of Chinese owned EV car makers.. all these items are currently in-play but likely will settle to continue providing a considerable advantage to Chinese owned EV makers especially for the higher volume lower cost EVs. It’s an interesting question as in, what’s the timeline to ev land? China is going at it in a way, that though flawed will certainly produce results, by hook or by crook, and road behind could be strewn with the wreckage of unintended consequences. I view the Central Committee as somewhat like kids in bumper cars, you really can’t wreck them, though you could get whiplash, have bumps and bruises, but eventually you get somewhere. They, the Chinese leadership are very persistent, but sometimes wrong-headed, and extremely stubborn. Corruption is endemic in the system, and almost requires a dictatorial cadre to run, but that’s been taken care of for the foreseeable future. The question of who runs the show.. So they’ll make progress, but there will be a lot of sparks, and shook-up people before it’s all over. About 2 decades hence…R.I.P. I.C.E. Bolt will go worldwide in the robotaxi format where the lack of RHD variant doesn’t matter. I doubt that. GM has no desire to sell. GM has invested well over a billion in robotaxi technology and testing. You think it’s just a hobby? Tesla has said that 5000/week in very early q3 (now, not earlier estimates) and continuing to grow in the remainder of 2018. It might not be 10,000/wk at the end of the year, but that was part of the revised goal at one point, but it does indicate that it will continue to grow past 5k/week. Back in January I forecast 90k Model 3 sold in 2018. I would however not be surprised to see that number climb up to bit, 100k for example. So far all optimistic production scenario have been shot down in flame by this very site (3’875 deliveries figure for April for example). A cautious pessimism seems to be the safe bet .I do see Leaf sales worldwide for year 2018 to be a bit beyond Model 3 sales (120k ?). One thing is producing cars, another thing is to make those cars 100% ready for distribution and get them in the client’s driveways. Also having enough service centers to address the glitches of a vast new fleet of Model 3 and an aging fleet of Model x’s might be an issue (considering the Model S as the least burdensome of the 3 as the oldest/thus expectedly the most reliable of the 3). Production is not all there is as a limiting factor. A good start is probably to discount all what Elon Musk says by a wide margin (for ex. 40% to start with, then adjust along the way). I’m more upbeat on Model 3 now, in the end it might reach 150k be year end if Elon’s latest promises hold true. I’d say 100k is a minimum that can easily be improved on. As for the Leaf, I also think around 120k for the year. It’s going to be a tight race! Quarter 1 of this year: 122,000 EV’s were bought in China. Biac Ec-Series on its own is selling almost 8.000 every month. I hope Tesla will be able to produce 6.000 /month by July-August, but “worldwide” BIAC, BYD and JAC are already leading in terms of amount of cars on the road. They don’t have reservations, just cars that are wanted and bought right away. Tesla Model 3 #1 in 2018? It is the most likely scenario, but it is not a given, not only because Tesla has to make >100k units, but because the EC-Series / Nissan Leaf might have a word on this. As for Manufacturers, Tesla could have more problems being #1, as BYD will be a strong contender, if they get their own production ramp up issues (New Qin, new Tang…) worked out. So far in my area, I’ve seen two leads and zero 3’s.